Leeds United head coach Uwe Rosler was pleased with the performance of his players despite a 2-1 defeat to Eintracht Frankfurt in a pre-season warm-up played in the Austrian town of Eugendorf. Crowd trouble at the end of the game marred the “friendly”, but on the pitch United took the lead in the opening period through Steve Morison only for their German opponents to hit back with two second half goals from Johannes Flum and Stefan Reinartz. On the balance of play Frankfurt were good value for their victory, but Leeds boss Rosler reckoned he had got exactly what he had hoped for from the contest. He said: “I think the players were terrific. “We played against a team with very good ball possession. We worked very hard against them and we worked extremely well in the shape. “The longer the game went on, we adapted to their quality a little bit better. “We kept the ball and scored the goal on the break. “For periods in the second half we matched them in the passing. I’m very, very happy – everybody got a run-out. “It did a lot for our fitness and there were no injuries. “Pre-season is all about preparing for 10 months. Today we saw a lot of mental strength. “Everyone who started or came on wanted to impress and work extremely hard. That was our chance today to compete against a very good footballing side. “The shape was very good. We had one or two problems we sorted out in the first half, so we became more stable. “After a while, the players got their breath back because they had to run a lot in the first 20 minutes. Striker Morison opened the scoring after 26 minutes on a hot night, slotting the ball past goalkeeper Heinz Lindner after getting on the end of a pass by Sam Byram. But Leeds were lucky to still be one up at half-time as Frankfurt dominated possession and came close several times, including hitting the crossbar. Flum did equalise after turning in Stefan Aigner’s header at the back post and Reinartz clinched the Germans’ victory 15 minutes later from close range. 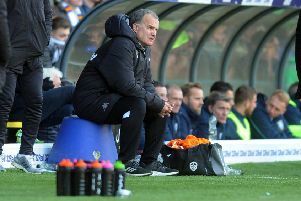 Leeds arrived in Eugendorf at the weekend for a training camp and will now head to Norway for a friendly game against another Bundesliga side, Hoffenheim, in Lillestrom on Saturday. A total of 25 arrests were made amid scenes of violence before and after United’s game with Frankfurt, Salzburg police have confirmed today. Three Leeds supporters, two police officers and two security staff needed hospital treatment as last night’s match in the Austrian town of Eugendorf ended amid chaotic scenes. A group of about 100 Eintracht supporters confronted United fans after the crowd spilled onto the pitch at the end of the game. Supporters from both clubs were then arrested, including 17 from Frankfurt, during the clashes. A police statement read: “At the square in front of the stadium, runaway Leeds fans were again attacked by the Frankfurt fans.